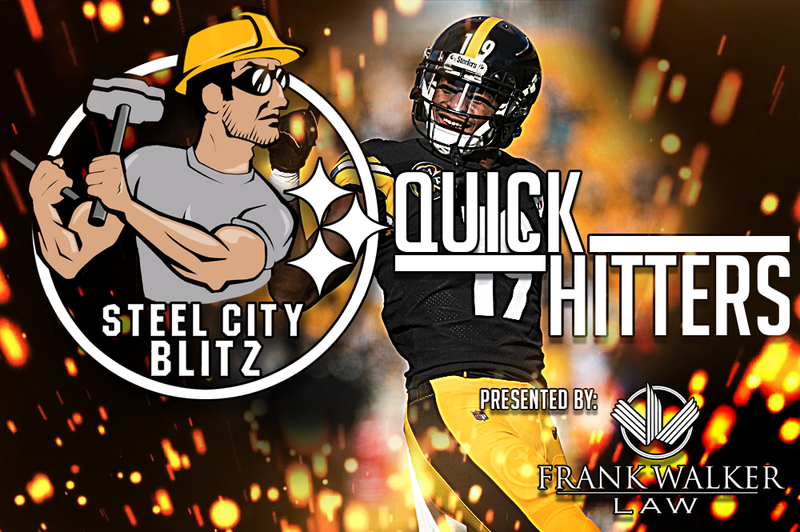 Today’s ‘Quick Hitters’ will be devoted to last night’s 51-34 loss to the Cheeseheads in Green Bay. If you thought the backup quarterback situation would settle out easily you’d be wrong. 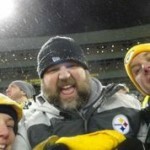 Landry Jones is you number two and didn’t play. The field was all Mason Rudolph’s in the first half and Josh Dobbs’ in the second. Both men would throw pick six’s but that was really the only thing they had in common. Rudolph went 5 of 12 for 47 yards with a pick and a TD to JuJu Smith-Schuster. Dobbs went 12 of 18 for 192 yards, two scores and an INT. Rudolph was sacked three times while Dobbs did not get sacked. Here’s the very first thing that must be kept in mind. Rudolph saw the majority of the Packers’ first time defense for much of the first half. Dobbs saw mostly second, third and fourth team opponents. That isn’t to slight Dobb’s performance it just is what it is. James Washington not only had two spectacular touchdown catches but just as importantly in my mind is the great lead block he had on Jaylen Samuels’ short TD run. That’s the kind of thing you don’t always see from wide receivers. Tweet of the Day… Watch Washington’s block right here. ?First career NFL TD Alert? The Steelers’ inside linebacker situation is no better today than it was before the game. Tyler Matakevich, who started last week, ran with the third and forth team last night. Jon Bostic was more consistent but my one fear with him was realized; he struggles to cover tight ends. Matthew Thomas played better than he did last week but still has a lot of work to do although his hustle down-field to nearly tackle the receiver on the 80-yard TD was really impressive. L.J. 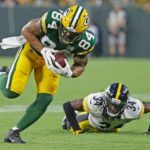 Fort had a nice game but was then beaten by the Packers’ number five tight end over the middle. The starting linebacker next to Vince Williams is not currently on this roster in my opinion. I’ll take that Stephon Tuitt played much of last season battling injuries. But he looked lethargic last night and he’s supposed to be 100%. I sure hope his play picks up in the regular season. The tackling was sub-par again. And it isn’t just young guys either. I’m tired of the “we don’t have enough practice time to work on tackling” excuse. Other teams don’t have nearly the problems we seem to have. Steelers’ backup offensive tackle Jake Rodgers got beat several times by Reggie Gilbert and that happens. What stuck in my mind was that Rodgers seemed to be totally uninterested in even being on the field. I can’t see him being around much longer. Kudos to Matt Wile who filled in for Chris Boswell last night. He only had two opportunities but nailed bot of his PATs. Jordan Berry had a busy night punting. He punted six times for an average of 44.5 yards. He’s got to be more consistent with his punting. In fact, I believe you’re going to see a more intense competition for that job coming. To be clear, the Steelers signed Nat Berhe for his prowess on Special Teams. If he has to play safety at any point during the season our D is in even bigger trouble. He doesn’t take good angles and flat out misses tackles. For a first round draft pick, I expected a little bit more from Terrell Edmunds in terms of coverage ability. He was beaten for two touchdowns and that happens. But the defense of the fade to a fourth string tight end was awful. He didn’t get his head around and did very little to keep the score from happening. He’s got to be better in coverage period. I’ve seen more than enough of Coty Sensabaugh. What can you say about James Conner’s night? Five rushes and over 50 yards and a score. He looks incredibly different than he did last year and in a good way. He’s quicker and running with even more purpose. I thought Jaylen Samuels did some nice things too. Catches the ball well and ran hard. Has to improve the blocking. The Steelers, like all teams, have a lot to work on. We should see most of the first team guys next weekend against the Titans.